Can the dead be brought back to life by viruses? Zombies have been a part of popular culture for decades. The living dead rising up to take over the world is a terrifying concept, worthy of Hollywood blockbusters and television hits. Some of those zombie fiction stories are based on infection by viruses or other organisms. Is it possible to bring dead tissues back to life by virus infection? You must tell facts from fiction; viruses need living cells to replicate because they do not have the molecular machinery at hand to generate energy and construct building blocks essential to life. So no, viruses cannot bring back the dead or revitalize dead cells. One thing that comes close to it are the so-called zombie ants. These ants have been infected by a parasitic fungus that can take over the ant's nervous system (Fig. 1). Fig. 1. 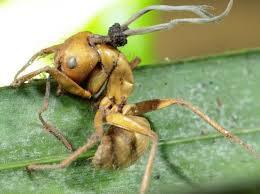 Zombie ant found in Brazil, infested with the fungus Ophyocordiceps. Source: National Geopgrahic. These fungi eventually kill their hosts, but before doing so they temporarily take over their nervous system. In the case of Ophyocordiceps unilateralis (Evans, 2011), the spores lodge themselves into the ant's head through an exposed part of the ant’s exoskeleton. The fungus then infiltrates and targets the ant’s brain, taking control of the ant. Then it makes the ant leave its colony and head for a leaf that provides the ideal conditions for the fungus to grow. The ant crawls under the leaf and goes into a “death grip”—biting down hard on the leaf's major veins. This allows the fungus to slowly feed on it. When the fungus finishes growing, it eventually kills the ant and releases its spores (Source: Smithsonian). The interesting thing is that the zombie ant not only provides shade and humidity when hanging under the leaf, it is also positioned directly on top of the ant’s colony, so when the spores burst out they fall on other ants and begin the cycle all over again. There are hundreds of mind-controlling fungi like this one, but the chances of this type of parasitoid fungus evolving to target humans as hosts are unlikely (Source: Smithsonian). Note: This answer is a complement to @AliceD's answer, and is partly reusing stuff from this related answer. In many cases the final interactions, or endgames, between a host and pathogen involve complex behavioral modifications such as the infected insect seeking an elevated position where wind currents can effectively disseminate conidia. 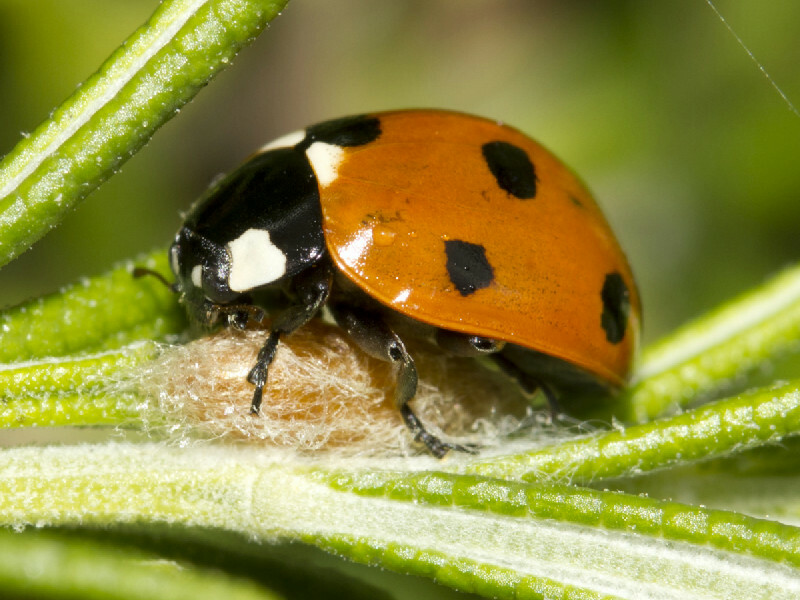 Elevation seeking by insects at late stages of infection is a common phenomenon that was recognized by early insect pathologists who noted that diseased lepidopteran larvae, such as Lymantria monacha (the nun moth), infected with baculoviruses migrated to the tops of trees where they died (94). This host-altered behavior was named “Wipfelkrankheit” or “Wipfelsucht” (meaning tree top disease in German) for viral diseases (41) and “summit disease” for fungal diseases (24, 57, 106). Overall, lots of information about the behavioural modifications of hosts caused by fungi and viruses can be found in Roy et al. (2006). One example of a such a virus that modifies the behaviour of insects is Lymantria dispar multicapsid nuclear polyhedrosis virus, which infects larvae of the moth Lymantria dispar and causes them to climb to high locations (tops of trees) before they die. In another interesting example a parasitic wasp might use a viral infection to control the behaviour of its host, so that the the host beetle is paralysed and is "guarding" the larvae and pupa after the parasitic larvae has emerged from the beetle (see Dheilly et al, 2015 and a popular account in Science). Dheilly et al. 2015. Who is the puppet master? Replication of a parasitic wasp-associated virus correlates with host behaviour manipulation. Proceedings B 282(1803). Not the answer you're looking for? Browse other questions tagged human-biology virology death or ask your own question. Can a zombie apocalypse really occur? What kind of fly is this? Can we really 'discover' 85% of mammalian viruses? Can Biologists identify all viruses? Do all +ssRNA viruses have similar structures and life cycles? Can bacteria be reservoirs for animal viruses? Can viruses survive Super saturated salt solution? Can proteins from different viruses be gathered in one virus?